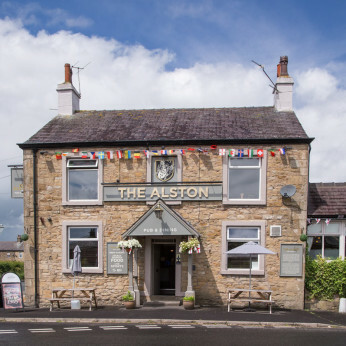 The Alston Pub & Dining is a newly refurbished Local Community Pub located in the small village of Longridge on the edge of the Ribble Valley. The Alston Pub & Dining is a newly refurbished Local Community Pub located in the small village of Longridge on the edge of the Ribble Valley. We have a wide selection of draught beers & real ales accompanied by a range of Boutique beers from all around Europe. Our Wine selection is of the highest quality and is supplied by Bowland Forest Vintners whose wine portfolio is second to none. Our drinks selection is completed by our wide range of spirits along with a broad range of soft drinks. The recent refurbishment includes the introduction of a new menu, with daily specials, weekly offers like our chip shop tea night and a choice of two meats on our Sunday roasts each week. The Alston prides itself on using fresh local products and ingredients in all our dishes to make our quality traditional pub food. Please take time to look at our current menu in the Menu section of this site. The Alston's atmosphere is very inviting and we offer a warm and friendly welcome to all customers, both young and old, making it a great place for everyone. The newly refurbished garden is one of the highlights of the Alston as it is the perfect place to chill out and take in the scenery of the Ribble Valley, with the trough of Bowland in the distance sit back and enjoy a refreshing drink and enjoy some fresh quality food. The Pub also will also be showing Sky Sports throughout the year with some of the worlds biggest sporting events being hosted on Sky this year. To keep everybody entertained the Alston will be hosting Live Music Nights throughout the Year and also has a weekly Quiz held every Tuesday evening from 9pm. We will also be hosting some fairly big events over the coming year such as our Scavenger Hunt and Beer & Music festivals. The Alston Pub and Dining, Quality Food, Quality Beer, Quality Service, Excellent Price, Superb Atmosphere and much more, we are your pub, the communities pub. See you soon! !